“Parables, predictions, prophecies, convoluted and abstract religious writings -- these only offer us a glimpse of the future, little snapshots, vague hints of what may yet be to come,” continued the Pope. “They were not meant to be taken at face value. One cannot assemble these little fragments and put them together, hoping they will suddenly reveal God’s masterplan for the future of mankind. God does not work like that. The future is not a game that can be revealed in advance by following some cryptic clues. These writings are simply markers, reminding us that the end is coming at a time that will not be revealed to us until the hour it arrives. Only then … only then will our eyes be opened. Only then, will we understand the magnificence of the Creator and be humbled by our mortal ignorance. “But until that time comes, we have to remain vigilant. To keep the faith, pray and be ready. It is not for us to try and change that which has already been ordained no matter how terrible it may seem to us. It will all come to pass according to His will. No, I do not believe that Hassan is the Anti-Christ. Perhaps he may be the first of the Four Horseman,” said the Pope waving the Gold Dinar in his hand. 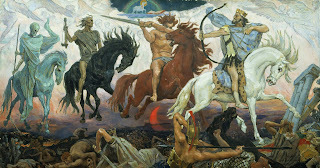 The Four Horsemen of the Apocalypse are described in the Book of Revelation as harbingers of the Last Judgment heralding the physical entrance of the Antichrist in the world. According to Revelation, the first will ride out on a white horse and is called Conquest. Next on a red horse is War. He will be followed by a rider on a black horse known as Famine and finally Death will emerge riding a pale steed. 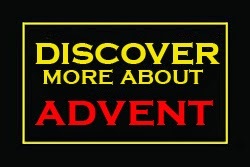 The novel Advent deals mainly with the first two and alludes to the identity of the third. The book suggests that the descriptions of the Four Horsemen should not be taken literally. For example Conquest achieves his goal not by claiming territory but by targeting the world’s financial systems and inciting the Muslim/Arab world with its strategic oil reserves against the United States. Some biblical scholars have long argued that Revelation should be read as a series of highly symbolic warnings with rich and colourful imagery describing the spiritual state of the Church and the world in the final days before the Last Judgement. To them, the Four Horsemen are emblematic descriptions of distinct events which will take place in the end times.